Epoxy floorings and coatings installed by Surface Solutions are so strong, they will stand up to the most demanding industrial environments while protecting facility surfaces, factory machinery and personnel from wear, chemicals, UV light, moisture, accidents and more. Epoxy is typically made up of two main components: 1) resin and 2) hardener. When they are mixed together, the chemical reaction forms a rigid plastic material that is strong and resistant to wear. It also bonds extremely well to most any surface. To install, epoxy floor coating contractors apply multiple layers of epoxy resin to the concrete substrate floor at different thicknesses. A true epoxy floor is at least two millimeters thick; anything less than that is considered an epoxy floor coating. Easy to clean, seamless and non-porous. Epoxy has no seams where bacteria and debris can accumulate and can be easily wiped free of dirt, dust and debris. Epoxy concrete floors withstand the extreme temperatures of wash-downs and steam cleaning. Exceptionally durable and long-lasting. Epoxy flooring systems protect concrete substrate slabs, transforming them with a high performance surface resistant to moisture that will last for years to come. Attractive and aesthetically pleasing. Epoxy dries to a high gloss shine and is available in a variety of colors, textures and applications such as solid colors and decorative additives that can beautify a variety of working environments. Chemically resistant. Epoxy floorings and coatings protect concrete from aggressive chemicals, acids, alkalis and solvents that destroy the surface, the underlying materials and can even penetrate into ground water. Improves safety in the workplace. Concrete floor epoxy ensures slip, impact, heat and fire resistance. In addition, high gloss floor coatings can also improve brightness in a work area by as much as 300 percent. Withstands impact from high traffic. Use different colors and textures of epoxy flooring systems to define safety zones, foot traffic zones, forklift zones and work zones. Epoxy floors reduce wear on transport vehicles, allow for faster material movement, increase productivity and prevent wear and damage to the floor. Environmentally friendly. Concrete epoxy flooring and finishes are considered safe, non-toxic building materials that provide an environmentally friendly flooring solution for companies interested in choosing “green”. Quick, easy application. 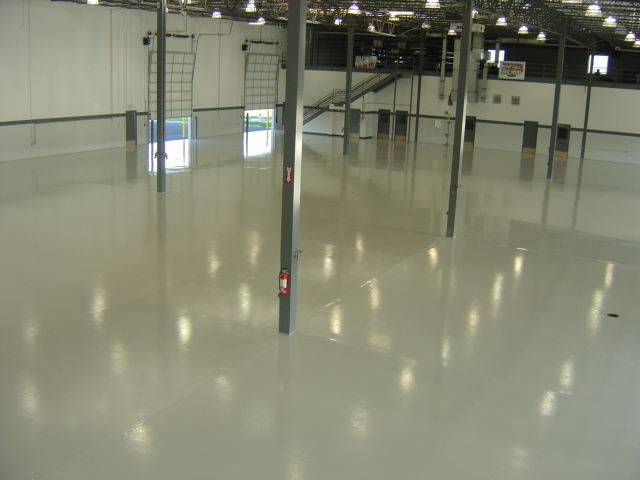 Because concrete epoxy flooring is self-leveling, installation specialists in high performance industrial flooring can apply an epoxy floor coating quickly over any new or existing concrete. Affordable, cost efficient. Epoxy concrete flooring and finishes offer durable, hard wearing surfaces that quick to install, require little maintenance and last for years at a price that won’t break the construction budget. Plan your project today with a free quote from Surface Solutions. We provide expert consultation and installation along with a full line of epoxy floorings and coatings in addition to other high performance industrial flooring systems. We are committed to 100% customer satisfaction on every project. Call today for a free quote (866-858-4080).